As well as offering a variety of NLP trainings, Inspiring Potential can also offer personal one-to-one sessions with a fully qualified, experienced NLP practitioner. Please read below for more information on each of these options. Neuro-linguistic programming (NLP) helps us improve communication and business relationships and as a result the business performance and bottom line. NLP is a set of tools and techniques that help individuals improve the way they communicate with others. By having a clear methodology of expressing themselves they can communicate effectively, negotiate better, influence others, motivate and inspire other people in their teams. Most of it is done by creating self awareness, and a developing a deeper understanding of human dynamics. By developing this deeper level of understanding they can become aware of their conscious and unconscious limiting beliefs, which they can change into more empowering beliefs. 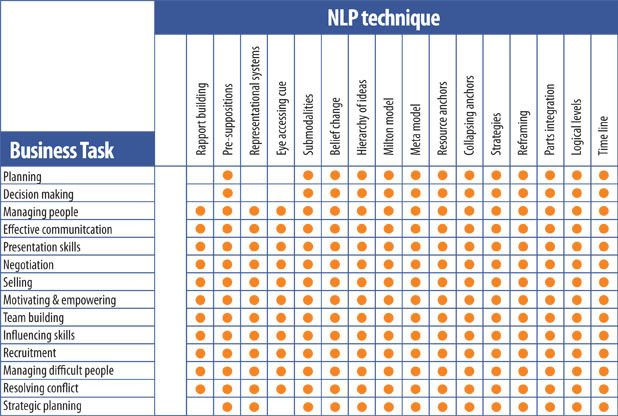 The table below shows how the techniques of NLP can help you with your business skills. Your organisation can experience the benefits of NLP via training courses, one-to-one sessions and taster days. Key staff can learn more about NLP by attending an NLP Business Practitioner Course. The course runs over 5 months and helps develop self awareness, a clear direction and improve communication and interpersonal skills. We also offer in-house NLP training. Please contact us for more information. Arrange a session with an NLP Practitioner in London, UK, Europe or USA. If you are interested in learning more about the benefits of NLP, and would like to experience it before committing to a full programme, we offer a one-day introduction to NLP. Offering NLP to Managers - NLP Article written by Marielena Sabatier published on TrainingZone.